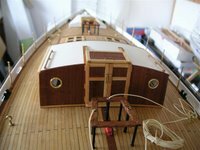 This is to be the record/diary/blog of my build of the Robbe Atlantis Twin Masted Gaff Schooner.The www seems bereft of much information,so I hope to plug that gap! Check back occasionally to see the progress. Well, my Atlantis is now sold, awaiting collection from her new owner over the Easter holidays. She will be heading to the North East of England, where I am sure she will enjoy her new life. 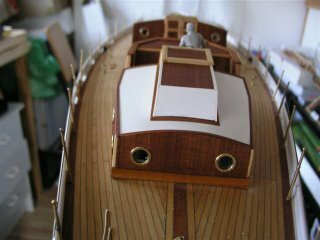 I am a little sad, to see her go, however my model boating days are now at an end, as I move on to pastures new in my modelling hobbies. I would like offer my sincere thanks to Taylor Sparks in the USA for all his support and advice throught my build of the Robbe Atlantis. Taylors web site is one of the few on the web that gave loads of information to Atlantis builders and owners, and certainly inspired me to make mine. Thanks also to Colin Harris in the UK for his occasional assistance. I do hope you have enjoyed this blog account of the build of my Robbe Atlantis, and that is has helped or inspired you with yours, along the way. All that remains is to say , thank you for watching ! Having had a few days annual leave, the weather has been kind, so I resolved to complete the Atlantis ready for her "sale" . I must confess, the Spring sunshine shows up her fine timbers and overall finish very well. She is far from perfect, many mishaps /errors /frustrations along the way, but I am confident, her new owner ( whoever that may be?) will be delighted. Equally, once she has been trimmed for sailing, she will inevitably gain an audience at the lakeside. 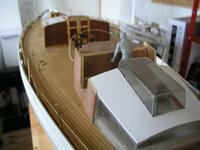 All that remains is for the new owner to complete the r/c installation, add the few remaining small fittings , trim, and sail away. She does look as pretty as a picture... but my mind is set, and she must now go, as I move to other hobbies. I sincerely hope that you have enjoyed my little build /blog and shared my frustrations as she comes to her conclusion. This has at times been a very challenging kit, in no small part due to some poor quality materials, and my own frustrations / errors. Here she is then, as she is prepared for "sale". Many thanks to Cal Keen, for recent emails sharing his appreciation for my Atlantis blog efforts, which he has found very useful in his own build. 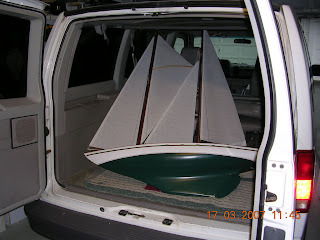 Atlantis in van: I am lucky to have a vehicle large enough that I can transport the boat fully rigged. 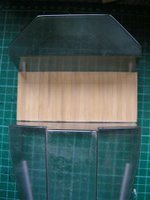 Sheets inside hull, close-hauled: I made a tray that slides back to the rear of the hull, all the way to the rear pulley for the sail winch. This is so the sheets don't get tangled in the electronics. 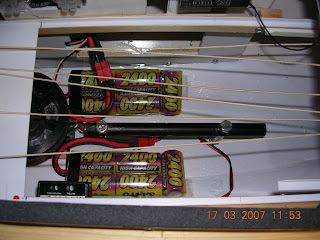 the carrying handle is the black tube shown in the picture. What I did was drill and tap 1/4" threads into the ballast weight, screw some bolts into it through the black aluminum tube. 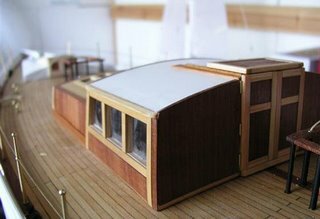 I can remove the cabin, slightly pay out the sails, slide the tray back, and carry the boat like a 38 lb. pc. of luggage. It really works quite well. When I get to the pond, wearing high top rubber boots, I just set her in the water,slide the tray closed, set the cabin in place, and get underway. The pond where we sail is not subject to heavy seas, so I don't need the screwed down cover under the main cabin. I am far from finished top-sides, but I am happy to be at the point of being able to sail. I bought the Atlantis as a retirement gift to myself, 2 years ago. I did some work on her and then did other things for about a year. Now I have renewed interest in finishing the project. I hope I haven't bored you with my notes and photos, I just want you to know that you have been somewhat of an inspiration to me to finish my project. I am looking forward to photos and notes of your finished Atlantis. Cal Keen "
Cheers for the input Cal ! Seriously, though.. with the cold weather, illness, and other interests, I just haven't found any inspiration to continue with the Atlantis. I have decided that, the purchase of the Atlantis was a foolhardy one, logistically it is too big a model to lugg around and sail on my lonesome. That, and my sailing buddy has decided to hang up his sails too. has led me to some serious thinking.I do not wish to sail alone, and haven't sailed since my last build ( Vaporetto) last Summer 2006. The" light/spark" call it what you will, has gone out, and I have lost interest in all things model boats. 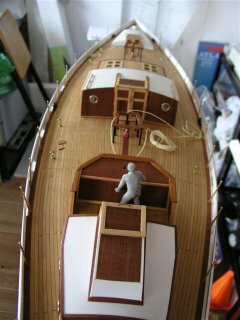 I am going to complete the Atlantis in the near future, and aim to have her finished for the Easter break April 2007. Then, she will be advertised on Ebay to be sold off to the highest bidder,with all the associated goodies, more details when I get that far ! Meanwhile, the final part of the build will begin again shortly. 2)The weather was so fine, I took advantage and gave my shed /workshop a coat of Cuprinol, to prepare her for the winter season. Anyway, I continued for many hours on this wheelhouse effort.. and effort is what it is.. It is again clad in these awful veneers and trimmed with spruce.. as is usual ( like Frank says) " I did it my way" and here is the result. I used all my remaining stock of mahogany planks, trim and lemon strips.. 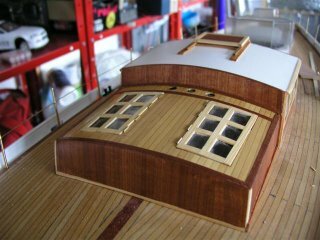 I made a decision early on to refit all the roof material in white, as I feel it contrasts nicely with the timber /veneers used. 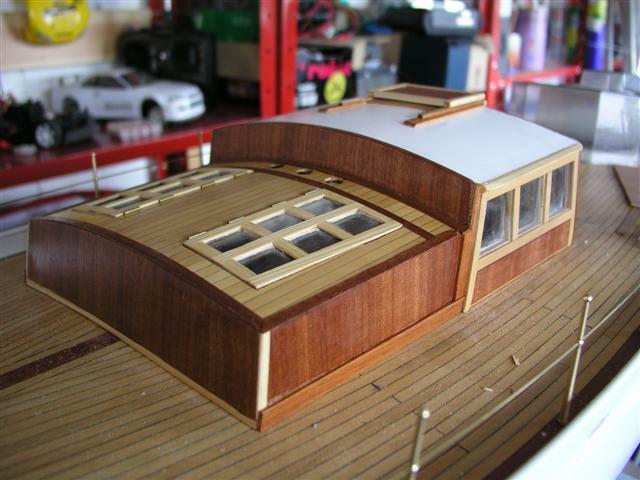 The following is the stern view, showing all 3 cabins with white roof material. The brass portholes are now fitted in situ.. 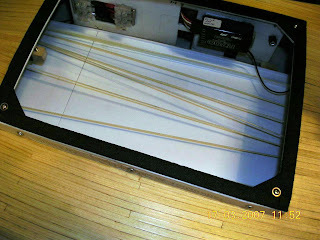 I was worried about this, given that one has to drill through this veneer stuff. 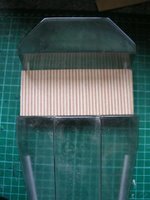 I found a 14mm flat woodwork bit to be the nearest suitable size, then finish with a round file or a dowel and glasspaper. 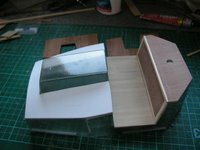 Whilst waiting for the tung oil to dry on the other 2 cabins, I made a start on the aft wheelhouse section. Again, I really, do not care for the supplied Robbe stripey veneer, so have planked the captains steering area with the last remains I have of the Lemonwood Gerona planking. Again, I think its an improvement.. though, this is obviously a personal taste thing. The veneer quality on this sheet seems a little better, no split parts or de-laminations yet ! Similarly the aft roof "stripey "material has been replaced with white plasti-card, that will be finished with Honduran Mahogany trim planks. I feel much happier with this part of the build, I think the white roof area will contrast nicely with the rest of the fine timbers used. This is how the cabin looks after a first coat of 50% Tung Oil, and 50% thinners... the way this stuff works on fine timbers is simply stunning. Thanks to Keith Jewell for showing me the way on this, this has to be the best finish for timber.. there is NO varnish on my vessel AT ALL !! The depth, and warmth of grain will improve further, as more coats of Tung Oil are added.. as I found on my deck.